Stinkhorns frequently bewilder people by popping up in lawns, thrusting their slime-covered tips into the world within a matter of hours. They have been much maligned over the years, probably because--well, because they stink and they often look like penises (human, canine, or alien). Unlike other mushrooms, the stinkhorn distributes its spores by applying an odorous, spore-thick slime to its tip, which flies and other insects are attracted to. The flies then carry the spores to other places. Several stinkhorns are common in North America, including the aptly named Phallus impudicus and the netted stinkhorn, Phallus duplicatus. Among the stinkhorns, species of Mutinus are fairly unique in their appearance: they look like pinkish to orangish spikes which arise from whitish "eggs" in the ground, and they are initially covered with brown or olive brown slime (before being ravaged by flies). Unlike Phallus species, which mimic human anatomy, Mutinus species have more of a canine thrust. The description below combines Mutinus elegans, Mutinus caninus, and Mutinus ravenelii, which stinkhorn specialists (there really are such people) consider to be separate species. According to Alexander Smith (1981), Mutinus elegans takes longer to "hatch" from its "egg" than Mutinus caninus. Roger Phillips (1991/2005) records a "pinkish" version of Mutinus elegans in which the stem narrows just below the spore mass; this may be Mutinus ravenelii. Phallus rubicundus is very similar in appearance, but has a distinct head that hangs skirt-like from the tip of the stem. European and North American concepts of Mutinus elegans, Mutinus caninus, and Mutinus ravenelii appear to differ somewhat, and some authors (e.g. McNeil, 2006) suggest that Mutinus caninus and Mutinus ravenelii are synonyms. Ecology: Saprobic; growing alone or gregariously in gardens, flowerbeds, meadows, lawns, wood chips, cultivated areas, and so on--also in hardwood forests; summer and fall; common east of the Rocky Mountains, rare to occasional in western North America. Mutinus ravenelii (see below) is apparently the most common Mutinus in eastern Canada. 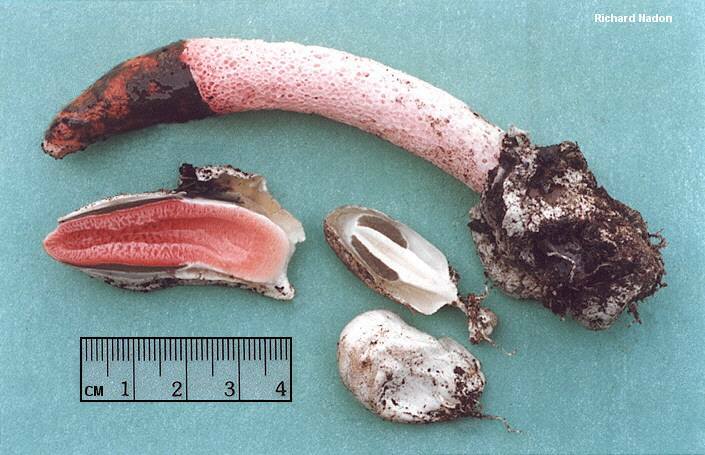 Immature Fruiting Body: Usually at least partially submerged in the ground; appearing like a whitish to pinkish or purplish "egg" up to 4 cm high; when sliced revealing the stinkhorn-to-be encased in a gelatinous substance. Mature Fruiting Body: Spike-like, 4-17 cm high by .5-1.5 cm wide; more or less equal, with a slightly swollen apex (Mutinus caninus and Mutinus ravenelii)--or more gracefully tapered toward the apex (Mutinus elegans); stocky in Mutinus ravenelii; often slightly curved in Mutinus elegans; sometimes whitish below, but pinkish rose (Mutinus ravenelii) to orangish or orangish red (Mutinus elegans and Mutinus caninus) above--or uniformly colored; rarely completely white, even at the apex (Mutinus caninus var. albus); often with clinging whitish volval remnants; minutely pocked and pitted (Mutinus elegans), or with fairly large pits (Mutinus ravenelii); with an olive brown to brown slime towards the apex (covering 2-3 cm in Mutinus caninus, more in Mutinus elegans) but usually not covering the extreme tip; the slime quickly becoming foul and odorous, and often quickly removed by insects; hollow; spongy; with a whitish, sacklike volva at the base. Microscopic Features: Spores 3.5-5 x 1.5-2 µ (Mutinus caninus and Mutinus ravenelii); 4-7 x 2-3 µ (Mutinus elegans); elliptical or oblong; smooth. REFERENCES: Mutinus elegans: (Montagne) Fischer, 1888. (Saccardo, 1888; Smith, Smith & Weber, 1981; Phillips, 1991/2005; Lincoff, 1992; Metzler & Metzler, 1992; Horn, Kay & Abel, 1993; Roody, 2003; Miller & Miller, 2006.) Herb. Kuo 05170701. REFERENCES: Mutinus ravenelii: (Berkeley & M. A. Curtis, 1853) Fischer, 1888. (Saccardo, 1888; Coker & Couch, 1928; Barron, 1999; McNeil, 2006).